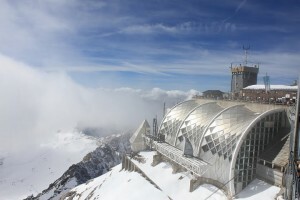 Zugspitze the highest mountain in Germany – 2,962 meters above sea level. Check weather report on official web-site. If you drive by car point your navigator to Grainau (3 Seefeldweg, Grainau 82491). There will be direction signs to the Eibsee Cable Car (in German Seilbahn – but you will for sure see small pictures of cable car) and there is a large parking. 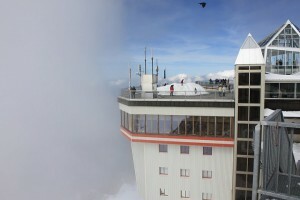 There are various possibilities to get to the top of the mountain, including train and several cable cars. Make sure that you will get back to the same point. From the top it is possible to get down to the Austrian or German side. Not advertised much, but really beautiful is glacier (Gletscher). 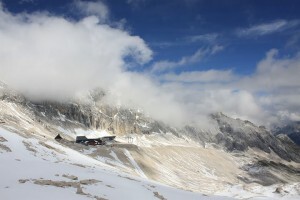 When you are on top go to the German side and take a cable car down to the glacier. Make sure you wear good snow-proof shoes. Check the timetable, make sure you will finish your walk before the last train/cable car departures.